Safari 4 also adds some bleeding-edge web technologies such as HTML 5’s media support (making it easier to add audio and video to Web sites) and offline support (so developers can write web apps that run even without an internet connection); CSS effects (which enable animations, like this example, without a lot of complex code or Flash); and speculative loading (which loads the files required to view a web page before you need them). 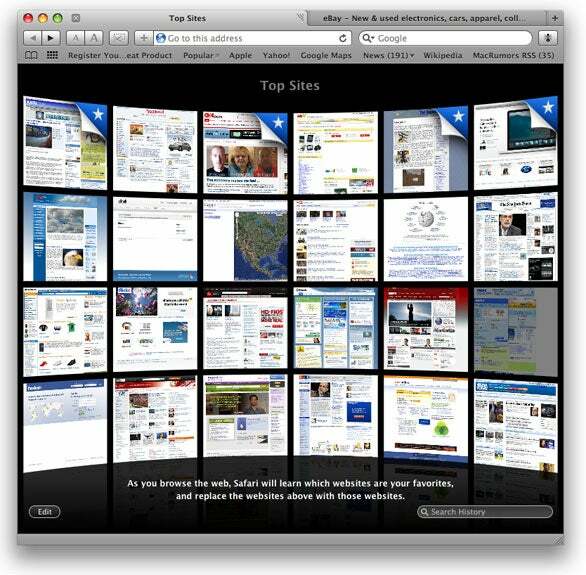 Visual Browsing: The Top Sites screen shows thumbnails of up to 24 of your most-visited pages. One of the more noticeable changes in Safari 4 is the new Top Sites page, which loads by default when you launch Safari. (You can disable the auto-loading feature in Safari’s preferences if you don’t like it.) Much like the Speed Dial feature in Opera, or the Speed Dial extension for Firefox, or the Most Visited feature in Google Chrome, the Top Sites page shows a page of website thumbnails, making it easy to visit a site with a single click. By default, Safari watches which pages you visit most often, and dynamically updates the Top Sites page based on the usage statistics, and doing things such as removing login screens and multiple pages within a domain. But you can also add your own sites to Top Sites. Just open two Safari windows, one showing the Top Sites page, and one showing the page you’d like to add to Top Sites. In the Top Sites window, click the Edit button. In the other window, just drag the want-to-add site’s icon (to the left of its address in the URL bar) into the Top Sites window. Drag it exactly where you’d like it to appear, then drop. When you drop the dragged icon, the site will be added to your Top Sites page. You can also choose from three icon sizes for the Top Sites page—Large mode shows six sites, Medium shows 12, and Small, a whopping 24 different sites. Not only can you see previews of your favorite sites at a glance, Safari will also let you know which of those sites have updates—a corner peel with a white star denotes an updated page. Visiting any Top Site is as simple as clicking one of the icons; the icon will expand to replace the Top Sites page with the clicked page. Cover Flow in Safari: Search all history, including full page text, using Safari 4's new Cover Flow view mode. 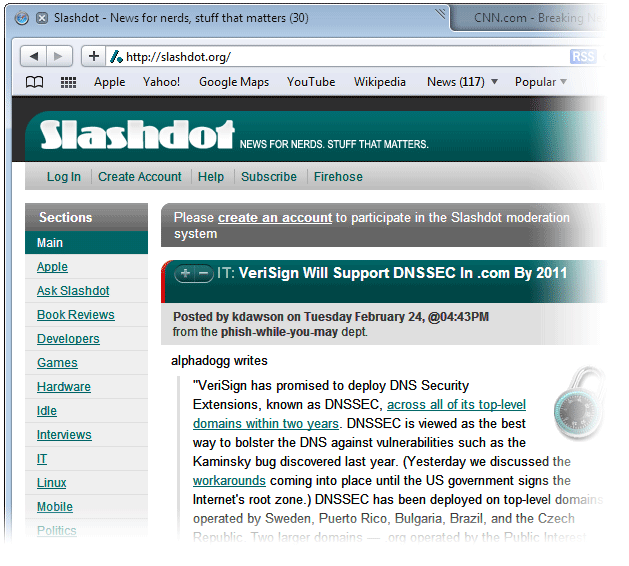 Another feature on the Top Sites page is a search box for searching your surfing history. Click in the search box, and you’ll see a Cover Flow-like view of web pages you’ve visited. As you type your search terms, the number of displayed sites decreases as sites are eliminated. Safari 4 not only searches titles and URLs, but also the full text of the pages you’ve visited. So you don’t need to remember something that was in the title or URL of the site you’re looking for; any term that was on the page will work just as well. You’ll also see a Cover Flow-like mode while viewing your History or Bookmarks pages; just like in the Finder, Cover Flow in Safari shows thumbnails (of sites, in this case) above the usual list-like view showing the title and URL for each site. The URL and Google Search fields have gained some serious smarts in this release of Safari. As you type in the URL field, Safari displays a drop-down menu showing what it thinks the best match is; you can load that page at any time by just pressing Return. Below the Top Hit, Safari displays two additional sections, showing possible matches from your history and your bookmarks. 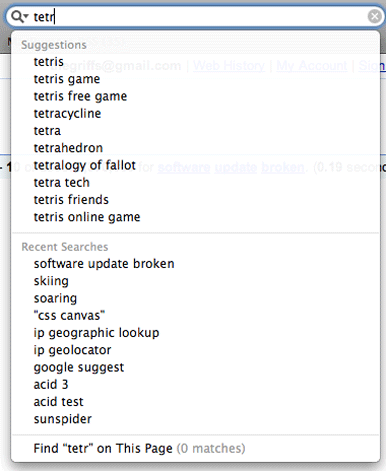 Google Goodies: Safari 4 shows Google suggestions, historical search suggestions, and a find-on-page entry in its drop-down menu. The Google Search box also displays a drop-down menu with three sections (assuming you’re viewing a Web page when you use the Google search box). The top section displays suggested searches from Google, based on what you’ve typed so far. The second section displays recent searches that you’ve run, and the last section (really just one line) shows you how many matches for your search term exist on the currently-loaded page. If you select this last entry, Safari will dim the screen and highlight the items on the page that match your search terms—just as if you’d pressed Command-F to use the find-on-page feature. A resources panel displays the loading order and time for every element on a page, showing you exactly where a hang-up might be occurring. You can also sort the results by latency, response time, or duration, and you can graph resources by size or load time. In my brief time with these tools, I’ve found them to be very well done—Safari 4’s tools may not offer every feature of the popular Web Developer and FireBug web development plug-ins for Firefox, but they come a lot closer than they ever used to—and the tools that are there seem to be very well done. Native Son: Safari 4 Beta looks and acts like a true native Windows application. Those who use Safari on Windows get everything discussed here, plus some additional Windows-only changes. Until now, Safari on Windows has looked very much like Safari on the Mac—the user interface, buttons, and even the font rendering were all taken directly from OS X. While Safari looks perfectly at home on OS X, it looked completely out of place in Windows XP or Vista, having an interface that was unlike anything else on the platform (except for iTunes!). Safari 4 Beta solves that problem by adopting a true Windows-native appearance, including native Windows font rendering. (Mac-style font rendering is available as an option in Safari 4 Beta’s preferences.) No longer does Safari look completely out of place when running on Windows; it now looks like it belongs on the operating system, which is a good thing if you’re a Windows Safari user. Safari 4 Beta adds a slew of new useful features—for both end users and Web developers—to what was already a very good browser. 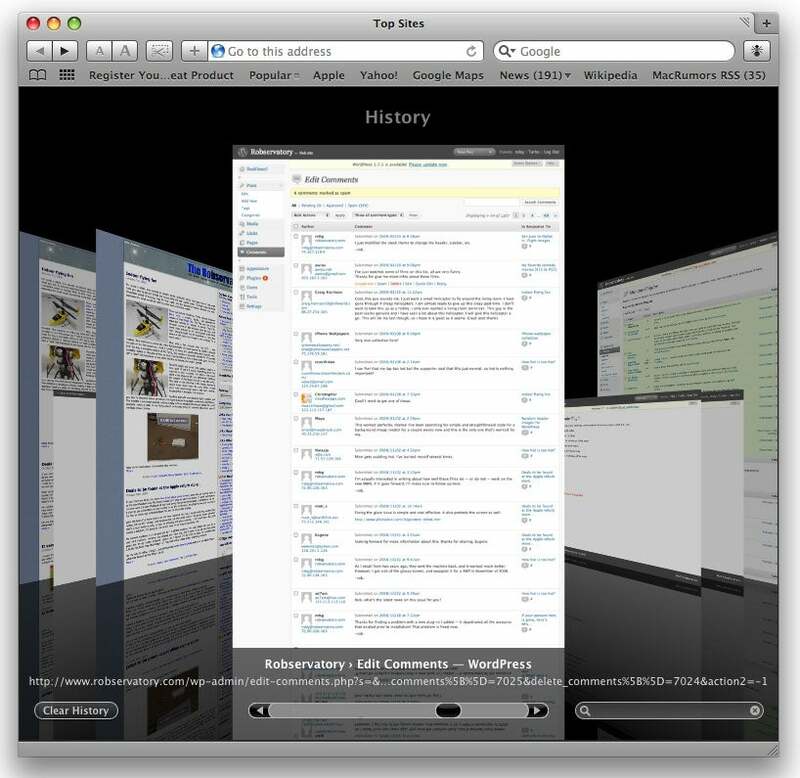 While it may take time for some to adjust to tabs on top of the window, the overall feel of Safari 4 Beta is one of speed and efficiency. The user interface does its best to stay out of your way (while still being quite feature-rich), and the low-level changes in the browser mean that web sites load quickly and efficiently. A full review will have to wait for the final release, of course, but based on what I’ve seen so far, I’m impressed with this beta version.